I'd been looking at Docker and saw this Slashdot post about a Windows container technology. As I was reading the comments, it made me think of how we used to setup a new Windows 3.1 machine. Basically, we got the machine on the network (with a PE3 if we had to problems!) and copied all the folders down. Change a few config/ini files and it was ready to go. Looks like I wasn't the only one thinking this way. "The is to solve the problem is simple. 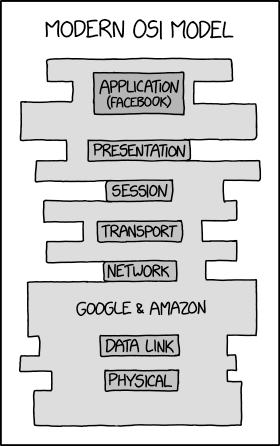 Keep the apps self contained. No shared libraries or dll. To move the package you just move the directory containing the app to an other location. Some will say that is how Macs do it. But I would go further and say that is how it was done in DOS. The shared library is an out of date concept, while sounds good when storage was expensive, today we are virtualizing full platforms just to prevent version incomparably. What may be a little bonus is to give application/process level networking settings so you can just virtual network your app from the OS"
I saw this article about tracking cattle in order to understand their social networks. The really strange thing is I had a conversation last Wednesday with an organization that had, at one time, deployed a wireless network to track cows for a research project. Who knew that cow networks were so common? I can only assume that this means the NSA can find any cow at any time. No, it wasn't me. And for the record, I usually find the on-site techs much easier to deal with. I love slideshows like this Business Insider presentation showing the state of the internet union. I wasn't surprised by anything in particular as I've seen the trends at home (thermostats, locks, etc.) and at work. For example, we were installing a new manufacturing line and made our usual assumptions about how many network ports would be required. Unbeknownst to us, the engineers had bought new versions of devices (like scanners) that were all IP based. In the past, these devices would have been connected to the PLC. It more than doubled the number of Ethernet connections we saw on a line that size.